One treat I’ve indulged in several times while in LA is Pinkberry, the premium frozen yogurt chain started here in 2005 by Shelly Hwang and Young Lee. Reviving the craze of the 1980s, when there was a frozen yogurt store in every corner strip mall, Hwang and Lee have expanded from their first store in Los Angeles to more than 100 locations across the US and even internationally. 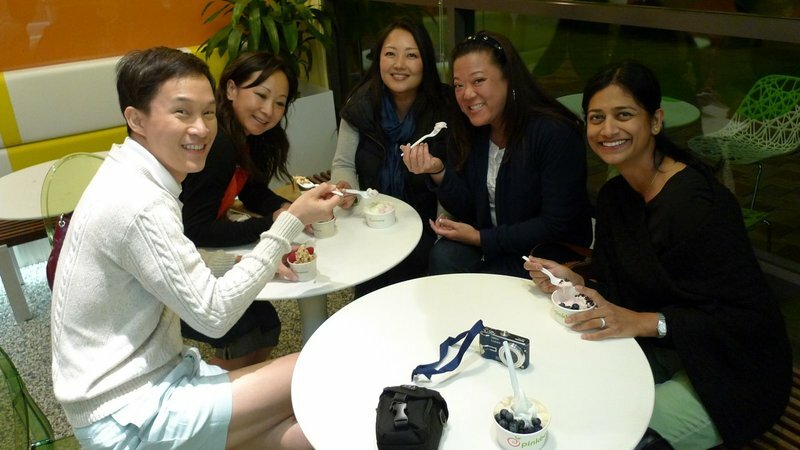 Tawn, Anita, Samantha, Lily, and Lalima enjoy their Pinkberry in Culver City. I’m not about to claim that this is some incredible food that you must rush out and try, but it is pretty good. I like that the quality seems high, they use only fresh fruits (not frozen or canned) as toppings, and if you choose carefully, a Pinkberry frozen yogurt can be a pretty healthful dessert or snack. One morning when I was at the Southwest Airlines terminal at LAX perusing my breakfast options, I realized that a Pinkberry yogurt with fresh berries and some low fat granola on top would be the best option among the breakfast pizzas, Croissanwhiches, and breakfast burritos on offer.
. We went to Pinkberry last night. 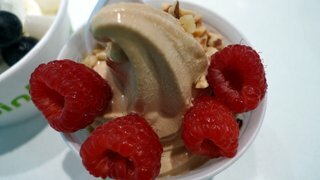 While they have frozen yogurt places in Kansas City, they are nothing like Pinkberry. There it is self-serve yogurt with flavors that underwhelm with their artificiality. Here it is pure, tangy goodness with lots of fresh toppings. 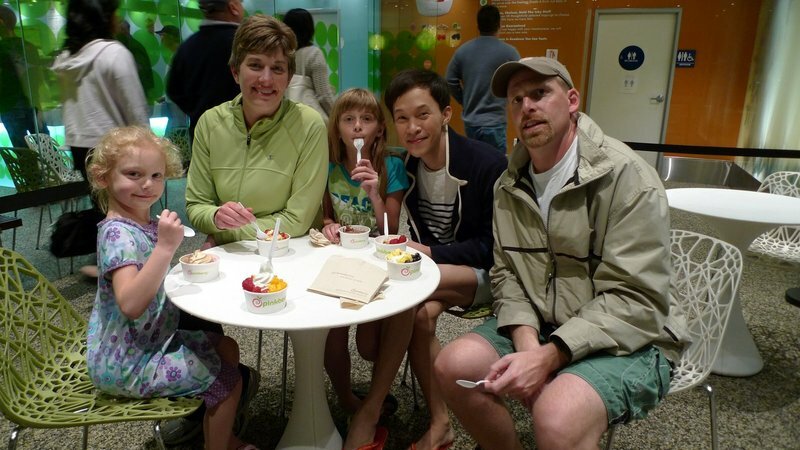 Even though it was a chilly evening by the beach, we bundled up for some Pinkberry! This entry was posted in Uncategorized and tagged dessert, food, Frozen, Pinkberry, Yogurt by christao408. Bookmark the permalink. I was there yesterday! Tried the new flavor! I don’t know that I’ve ever had frozen yogurt… that stuff looks *good*. You are sounding more and more like the galloping gourmet. Where’s the cook book ?? I have not hear of Pinkberry – here there is Best Yogurt On Earth store which I believe is part of a chain. Excellent by the way. We don’t have Pinkberry here, but Qoola is all the rage. It’s basically the same concept, and I love it! *sigh* ther are no Pinkberry shops in Indiana. Perhaps when they open in Chicago… We have Ritter’s Frozen Yogurt. It is good but they have usually 3 flavors of the day and if you don’t like the listed flavors – you can only get vanilla or chocolate. When they have dark cherry or peach I’m happy. More often than not it is coconut, banana, or cookie dough – blech. I’m glad you’re enjoying your vacation. A beach house – that sounds wonderful! When I lived in NY I was in love with Pinkberry. It can definitely be healthy and can taste awesome with the right combination of toppings… like Fruity Pebbles…. hahaha i’ve been to that pinkberry! i went there for the first time when i was back in la visiting my friend. i like frozen yogurt… maybe i should make some! @CurryPuffy – Which one? Salted caramel? What do you think of it? I find it nice, but too strong a flavor to mix with anything else. @kunhuo42 – Did you know the original is now closed as a retail store and is just their offices? Parking remained an issue. @NVPhotography – Gummy worms! Why did those seem so much more enjoyable as a child? @jace1982 – Oh, but Japanese soft serve is really good. Surely you can find some of that, Jason! @KidGohan – LOL – yes, Fruity Pebbles are the HEALTHY topping option. I caved in and put some Cap’n Crunch on mine one visit. @ElusiveWords – It is working out nicely, thanks. @npr32486 – The power of Xanga to drive consumer behavior! @murisopsis – One of my big issues with yogurt and soft serve places is the artificial flavors. They’re too overwhelming. @The_Eyes_Of_A_Painter – “Galloping”? Strolling, more like! HA…@Fatcat723 – With a name like that, they really are confident, aren’t they? =D@mizz_chan – I’d imagine there are any number of chains trying to cash in on the same craze. 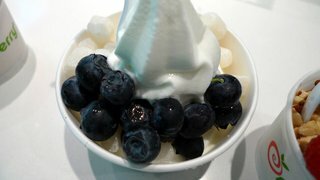 @ThePrince – We have red mango in BKK, but they don’t have mochi topping, which pinkberry has off-menu. @Passionflwr86 – Really? Never had frozen yogurt? How have you been so sheltered, Meg!? @Dezinerdreams – You need… to… come… back… to… Los Angeles! Sounds very good. The most that my little town offers, is TCBY. I don’t much care for it, but have gone there occasionally.A beach house? Chris that is wonderful. How good that the nieces and your sister with her husband were able to join you. Have tons of fun. memories … ah, frozen yogurt memories. I remember cycling Rattlesnake Point and always ensuring my ride ended in Campbellville as there was a old shack right by the railway tracks that sold handcrafted furniture but had one of those old hand-pull frozen yogurt machines where you tossed in the brick of yogurt and your favourite fruit and cranked it out yourself. … and aaron and I tried some pretty fine sobert at Haagen Dazs (of all places) here in Washington just yesterday. We no have Pinkberry but we have Red Mango!